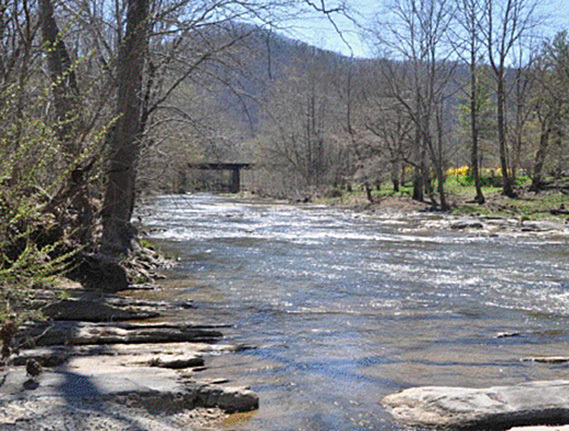 At its June 26 Board of Trustees meeting, the Virginia Outdoors Foundation approved the designation of a new Special Project Area in Rockbridge and Botetourt counties. The Buffalo Creek-Purgatory Mountain Special Project Area encompasses 178,800 acres bordered on the west by the George Washington National Forest and on the east by the Blue Ridge Parkway. Providing headwaters of the James River, this relatively pristine agrarian and forested area has seen extensive easement activity in recent years. It includes one of the few remaining intact rural east-west connections between the Allegheny and Blue Ridge Mountains. This undeveloped corridor provides critical habitat connectivity and safe passage under Interstate 81 for wildlife between the ridge systems. The area was nominated for Special Project Area designation by the Rockbridge Area Conservation Council (RACC) and Valley Conservation Council (VCC) —two local groups that have been key partners of VOF in protecting open space in the region. Of the 51,000 acres that VOF protects in Rockbridge and Botetourt counties, approximately 19,000 acres lie within the new Special Project Area. VCC Executive Director Faye Cooper agrees. “This special designation supports a focused conservation effort in an area of great ecological value and compliments the land-saving accomplishments of private landowners in the area who already have taken steps to conserve their lands,” she says. The area also contains numerous cultural resources, such as Native American historical sites; the Aubrey Paul fort, active during the French and Indian War; remnants of the Natural Bridge-Dagger Springs Turnpike constructed in the 1830s; and the historic Greyledge Plantation, which played a role in the early iron mining industry in Virginia. Efforts to designate the Buffalo Creek Rural Historic District are currently underway. The Special Project Area nomination was supported by officials from Botetourt and Rockbridge counties, the Historic Lexington Foundation, the Rockbridge Historical Society, the Upper James River Resource Conservation and Development Council, and several local landowners. With the Special Project Area designation now in place, RACC plans to finish the ongoing wildlife survey led by RACC board member and bear specialist Mike Pelton, which documents wildlife movement under I-81. Following that, events are planned for landowners in the area who want to learn more about the opportunities for conservation easements and meet with neighbors who have already established easements on their property. For more information or to get involved in any of these activities, in Rockbridge County contact Barbara Walsh at (540) 463-2330 or racc@rockbridge.net, and in Botetourt County contact Genevieve Goss at (540) 966-4606 or genevieve@valleyconservation.org.